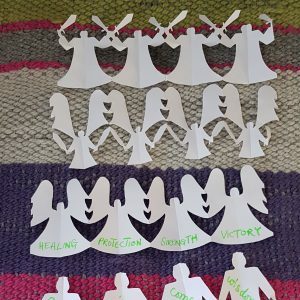 Make angel shaped paper dolls, and tape them together to make angel bunting! I love having paper and thus recyclable decorations. It gives us a chance to have fun making them each year, and means I don’t have to store them afterwards. I do these using A3 paper as it give you bigger angels and they’re less fiddly to cut. First decide what shape you’re going to make your angels – this could involve a bit of a family discussion about what angels are like. Do they have wings? Are they male or female? Are the children angels? Do they have swords? You might want to have a look at some Bible verses about angels. Next you need to cut the A3 paper lengthways, giving to two strip of long paper. Put these together and fold them in half lengthwise three times. Unfold your paper and use the folds as markers to re-fold your paper, but this time concertina – ie forward and back. When you’re all folded, find the open edge, the one with the beginning and end of the paper – this is the edge of your angels. You should draw the head on the other side of your folded paper, drawing only half an angel. Cut out your drawing and gently unfold. Make lots of these and tape them together to create your Angel Bunting. You might like to listen to some of the Christmas Bible story about angels while you’re making them. We also have made these and sent them to friends as a symbol of our prayers for angels to guard and support them in a difficult time.